In many ways, I want to pick up the same theme as last week. This is because I discovered this week that among the elements within the new GCSE syllabus is the role of medieval or early modern historical sites; and that in Key Stage 2 and Key Stage 3 a local study using primary sources is one of the criterion. In my opinion, such an emphasis on a student’s own locality in the past seems a good idea because just as microhistory can be used to understand the ‘bigger picture’, so a local history study, provided it is set within its regional and national context, can be both rewarding and enlightening. The relaunch of the Centre for Kent History and Heritage is now just over a fortnight away and it will be great to hear Paul Bennett’s inaugural professorial lecture entitled ‘From Benghazi to Canterbury: an Archaeologist’s Tale’ on Tuesday 6 December. In case you have missed seeing information on this, it will take place at Old Sessions House on the Canterbury Christ Church campus at 6pm, with a wine reception from 5.30. Do please come along to this free lecture. As a further notice, tickets are continuing to sell well for the Centre’s Tudors and Stuarts History Weekend from Friday 31 March to Sunday 2 April 2017. Any surplus after expenses will go towards the Ian Coulson Memorial Postgraduate Prize fund that will help those wishing to study Kent history topics at Christ Church. This is a valuable venture and it is great to be working with the Canterbury Cathedral Archives and Library again, and to have extended this to the city’s Beaney: House of Art and Knowledge. Details of the various talks and other events during the Weekend are available through the website or by contacting the Christ Church box office. Similarly tickets can be purchased through the website: http://www.canterbury.ac.uk/tudors-stuarts or by contacting Ruth Duckworth at the box office: artsandculture@canterbury.ac.uk or phoning 01227 782994 (Monday to Thursday, office hours). Keeping with this theme of collaboration in the fields of history and heritage, whether between Canterbury Cathedral and the universities or between the universities themselves, this week I shall focus on three events that took place yesterday. The first involved the visit by Professor Tim Ingold from the University of Aberdeen who has spent two days in Canterbury as part of the ‘Material Web’ project in the Centre for Medieval and Early Modern Studies at the University of Kent. Tim Ingold is a social anthropologist who has written extensively on materiality but his primary focus in a series of lectures, workshops and visits at Canterbury has been buildings, books and boxes (or cabinets of curiosities). Having missed several of these sessions, I joined those from Kent with Tim in the cathedral archives to explore the Bargrave cabinets of curiosities and then several manuscripts and printed books. Unlike the cabinets that belonged to members of the aristocracy, the 17th-century Bargrave collections contain such items as glass eyes, a desiccated chameleon, a Frenchman’s finger and what appear to be seal bags. Just how these cabinets were used remains a moot point. However, one wonders whether they offered talking points after dinner, the host and his peers gathering around to consider the wonders of nature and how man, as God’s creature, sought to work with the attributes of the natural world to produce things of interest and beauty. These cabinets also contain collections of coins and there is a remarkable manuscript in the cathedral archives, known as the Birch manuscript from its likely creator, which contains pages and pages of illustrations of ancient and other coins. Birch seems to have fascinated by a wide range of things because his book is full of drawings, many he coloured and among the subjects he selected are animals, including fabulous beasts, heraldry and monarchs. Although his is not the only hand in the manuscript, much of the book was seemingly completed in the later decades of Elizabeth I’s reign, and, even though, this is not a cabinet of curiosities one wonders if the driving force behind its creation is not dissimilar. This fascination with travel, the exotic, the other, but also that which can be mapped, contained spatially, measured and quantified is a fascinating cultural phenomenon of the late 16th and early 17th centuries. 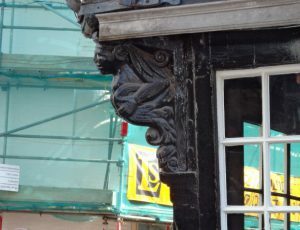 Maps similarly display these complex ideas through the ways people from different cultures were drawn in the borders that increasingly adorn such display items, and keeping with material culture, the dragon beam at the corner house in Palace Street from the mid 17th century seems to similarly express European unease, but also containment. The idea of tension within society is also applicable for my next event. In the early afternoon, I joined Dr Ben Marsh and Dr Philip Slavin at the University of Kent for Ben’s second session of the People’s History of Kent initiative. Ben is seeking to introduce Year 12 students to the study of ‘ordinary’ people through a wide range of evidence and to give them a taster of the type of research undertaken at universities. Consequently, the previous session had been at the Kent Library and History Centre at Maidstone and yesterday’s session introduced the students, and two members of the U3A, to three academics. I missed most of the first speaker but the form of evidence presented was oral history. However, I did hear Philip as he discussed what we know about peasant society in the 14th century. Philip is especially interested in crises, which meant that he focused on the Great Famine, the Black Death and the Peasants’ Revolt. In response to the questions posed, he noted that the sources, although abundant for Kent and England more broadly, in the form of manorial court rolls, are extremely difficult to work on being in highly abbreviated Latin. Philip has been to many archives and thus has an exceedingly large collection of digital photos of these court rolls, but for students that language barrier, as well as the problems of palaeography, are probably insurmountable because only a tiny amount of this material has been made available in source books and similar publications. As a way of providing something more accessible, and to give the students a break from listening to another presentation, I took the opportunity to introduce them to the Prebendaries’ Plot of 1542-3. In particular, what I wanted to do was to give them some of the depositions or witness statements collected by Archbishop Cranmer from across the Canterbury diocese that offer a fascinating snapshot of religious ideas at the level of the parish during this time of change and uncertainty. To give them hopefully enough context for this session, I provided in broad-brush strokes a picture of Henry VIII’s Kent in five points. I then showed how the reformed clerical community at Canterbury Cathedral was split between religious conservatives: ‘Catholics’ and ‘evangelicals: ‘Protestants’, the former seeking Crammer’s downfall but thwarted by the king’s directive that the archbishop should investigate the plot against him. From this position of some contextual information, each of the groups looked at the depositions from one area: Ashford, Maidstone or Faversham to see if they could start to answer a number of research questions. Although time was limited, it was great to see how each group came up with different ideas using the evidence and that they could begin to see how such archival sources can illuminate our understanding of religious, but also economic, political and social factors in the past. As an aside, I will be using these same depositions for my talk at the Tudors and Stuarts History Weekend on ‘Neighbours across the religious divide’. My third event was a presentation by the cathedral’s ‘Canterbury Journey’ team to its university partners regarding where the Heritage Lottery funded project has reached in its own journey to completion in 2021. Having only met a few members of the team before, this was exceedingly useful and it will be interesting to explore how the Centre can become involved in this exciting venture. Several of the aims of the team would appear to have common cause with the Centre, such as the desire to improve physical and intellectual access to heritage, as well as the wish to understand heritage better and to share it with others. Moreover, just as the Centre is seeking to reach several audiences, the cathedral’s team has similarly identified a number of groups such as learners, those traditionally seen as hard to reach, the general public and the local community. The outputs, too, highlight common cause in that the Centre has put on conferences, workshops and exhibitions, and ideas such as master classes, short courses and online resources may be feasible in the future. 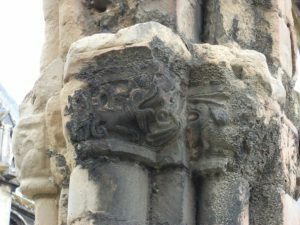 Certainly Dr Diane Heath, who works for the Centre, would like to draw on the wealth of beast imagery around the cathedral, especially in the crypt, to work with the team to enhance people’s experience of what these creatures meant and how they were deployed by monastic audiences, as well as thinking about them in modern terms. It is clear that the cathedral team has a bold strategy and an ambitious programme, not least because from now until 2021 each year has one ‘big’ theme, as well as a major programme of restoration and conservation of the fabric from the nave roof and western towers to Christ Church gate. Furthermore, other parts of the project will seek to enhance the welcome centre by providing among other things community and exhibition spaces. Link to these will be attempts to open up the collections, whether this means putting on more displays of artefacts, books and manuscripts, or offering greater opportunities for volunteers or students to gain transferable skills. All of this is admirable with regard to bringing the cathedral and universities together in common cause, and it will be interesting to see how such initiatives develop over the next few years.